10. Jarron Gilbert and Juaquin Iglesias-Round 3 2009: In the 2009 draft it was critical for the Bears to hit on their picks, as they did not have a first-rounder due to the trade for Jay Cutler. Chicago's first pick that year was in the second round, 49th overall. Jerry Angelo and his staff decided to trade down rather than use the selection, netting Seattle's third and fourth-round picks in return. With the extra picks the Bears selected Iglesias, wide receiver from Oklahoma in the third, and cornerback D.J. Moore from Vanderbilt. Moore has ended up to this point being a solid, playmaking nickel back unsuited to be a starting corner. But available in the second round were center Max Unger and tackle Sebastian Vollmer, solid players in the NFL at what are still need positions for the Bears. With their own third-round pick, the Bears selected defensive tackle Jarron Gilbert from San Jose State. Gilbert was a relative unknown who became a draft sensation when the You Tube video of him jumping out of a pool from a crouch [http://www.youtube.com/watch?v=rXDSPbZ_OUw]. Too bad Gilbert's pool-jumping skills never translated to the NFL; he was active for four games as a Bear and cut the following season. Iglesias was active for only one game as a Bear, and Chicago let the Minnesota Vikings sign him off their practice squad in 2010. Two third-round picks, four games active, nothing in return. 9. Roosevelt Williams-CB-Tuskegee-Round 3 2002: Angelo started his penchant for trading down in the first draft he led as a general manager. In 2002, instead of using the 63rd overall pick the Bears traded down nine spots in exchange for the Dallas Cowboy's third-round pick and a swap of fourth-rounders. With the extra pick in the third, the Bears selected Williams. The cornerback was from a small school, but was a draft-climber that was considered a potential small school sleeper. But it didn't happen. When the 2002 Bears' season fell apart en route to their 4-12 finish, Williams earned playing time. He was burned several times while in the lineup, but did make a game-saving tackle in a late season victory over the New York Jets. He did not make the 2003 Bears roster. Remarkably, Williams did end up starting three games for the Cleveland Browns in 2003, his last in the NFL. 8. Dan LeFevour-QB-Central Michigan-Round 6 2010: It's hard to call any sixth-round draft pick a mistake, since the vast majority of these players aren't expected to go onto great NFL success. And Dan LeFevour was a record-setting college quarterback. But there are several reasons for this. Late in the 2010 season it was revealed that during that year's draft, Angelo's staff had called Buffalo running back James Starks and told him he would be Chicago's sixth-round pick, 181st overall. The drafting of Starks would have been a sly move, as he had spent his senior college season out of football with an injury. But after they had called Starks, the Bears changed their mind, picking LeFevour instead. The Bears ended up waiving LeFevour in the final preseason cutdown with hopes of signing him to their practice squad, but the Cincinnati Bengals pounced, adding him to their active roster. Starks was nabbed by the hated Green Bay Packers with the 193rd overall pick of the draft, and began to earn significant playing time in 2010, even leading the Packers in rushing and scoring a touchdown against the Bears in the NFC Championship game the Bears lost at home. Granted, Starks may not be a long-term starting running back in the NFL. But the Bears got nothing out of LeFevour. And considering the wasted gambles the Bears have made on Matt Forte's backup in 2010 and 2011 (Chester Taylor and Marion Barber III), in retrospect Starks should have remained Chicago's pick after that fateful phone call. Former Bear personnel director Greg Gabriel stated it was his most embarassing moment in scouting. 7. Garrett Wolfe-RB-Northern Illinois-Round 3 2007: Angelo again traded down in the ill-fated 2007 NFL draft, a year that failed to produce a single selection that is still with the team as of 2012. For the Bears' 37th overall selection (obtained in a swap of second-round picks with the New York Jets for RB Thomas Jones), the Bears obtained from San Diego their second, third and fifth-round picks in 2007 as well as their third-rounder in 2008. With the Chargers' third-round pick the Bears chose Wolfe. The pick was a shock to most, as the diminutive runner was predicted by most draftniks to go anywhere from the sixth round to being an undrafted free agent. Yet Angelo made the pick in a place where winning teams need to find starters. Angelo would go on to say that his organization felt so strongly about Wolfe that in the end it didn't matter where he was selected, as long as the Bears got him. In retrospect, players Angelo might have selected rather than Wolfe included starting NFL tackles Doug Free and Jermon Bushrod, safety Dashon Goldson, or new Bears running back Michael Bush. 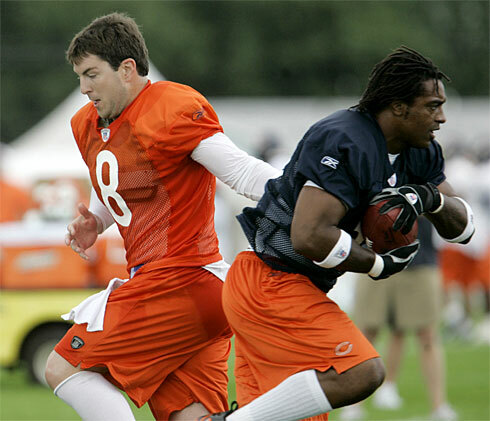 Wolfe was tried as a gadget on offense by the Bears mostly in his rookie season, without much success. Wolfe did end up being a solid special teamer, but in his four years with the Bears only rushed 72 times for 282 yards (3.9 yard average) and a single touchdown. 6. Chris Williams-T-Vanderbilt-Round 1 2008: In fairness, entering 2012 Williams is still a starter for the Bears, unlike many of Jerry Angelo's top draft picks. He has not been a complete bust, but with the 14th overall selection in a draft, general managers are held accountable for strong results. The Bears needed a left tackle in this draft badly following a bad drop in the line's production in 2007. Right tackle Fred Miller in particular had regressed. And in the '08 draft there was quality and quantity at the position. In retrospect, being that he was in the market for a tackle, Angelo might have done whatever it took to trade up two spots for perennial All-Pro tackle Ryan Clady instead of letting the Denver Broncos take him. (Although this most certainly would have required the Bears second-round pick and more, so no drafting Matt Forte.) As far as projected left tackles went, in terms of skills, Williams was the next best available prospect after Clady and top overall pick Jake Long. Pittsburgh's Jeff Otah was thought to be a better prospect, but completely projected on the right side of the line. Virgina's Branden Albert was another top prospect who projected on the left side or as a guard. Problem was, it was later revealed that Williams was off many teams' draft boards altogether due to concerns with recurring back injuries. Angelo made Williams the pick, and on the first day of training camp Williams injured his back. This put him down for most of his rookie season, forcing veteran John Tait to move to the right side and journeyman John St. Clair to man the left side throughout the season. Williams would start through the 2009 season and early in 2010 at left tackle, before being moved to guard. Midway through the 2011 season Williams injured his hand and was lost for the year. The jury is still out on Williams, who is set to become a free agent following the 2012 season. Again when GM's are expected to score with players in the top half of the first round, Angelo did in our opinion strike out here. Had the Bears drafted for the best overall player, they may have been better off selecting Albert. 5. Michael Okwo-LB-Stanford-Round 3 2007: Another collosal bust from the 2007 draft. Okwo was selected with the Bears' own third-round draft pick that year. The team was in the thick of Lance Briggs' (first) contract dispute, and Angelo projected Okwo to have a similar skillset to Briggs. Okwo was placed on injured reserve prior to his rookie season, then released before the 2008 campaign. Nothing more to say about the player other than Angelo threw away a high draft pick for nothing in the end. 4. Mark Bradley-WR-Oklahoma-Round 2 2005: Bradley was not listed anywhere in the 2005 version of Lindy's NFL Draft guide, thus I reacted to the pick with wonderment. He was tall and fast, and also had red flags flapping in the wind around him due to knee injuries. Bradley looked like he would be a find in the first half of his rookie season, then he tore his ACL as he had done previously in college. He then continued as only a role player in 2006 and 2007. He was cut shortly into the 2008 season. Bradley was selected extremely high-with the seventh pick in the second round. Players that the Bears could have selected in that spot included Pro Bowlers Michael Roos (OT), Nick Collins (S), or Vincent Jackson (WR). Bradley finished his Bears career with 583 receiving yards on 34 catches and four touchdowns. 3. Dan Bazuin-DE-Central Michigan-Round 2 2007: One of Angelo's collosal busts. Angelo thought the small-school end would be a sleeper. Not much here to write about a player that never suited up for a game and was cut following one year on injured reserve. In fairness to Bazuin and Angelo, a knee injury during the preseason followed by a second surgery didn't help the situation. But even after coming back healthy, Bazuin failed to catch on elsewhere in the NFL. Whether this was due to lack of overall talent or directly due to the injury, we will never know. 2. Michael Haynes-DE-Penn State-Round 1 2003: The biggest busts are reserved for the failed first-round picks. Haynes was selected with the 14th overall pick, their top pick in the draft that year, after leading the Big Ten conference in sacks the previous year. The Bears could have stayed with the 13th pick and taken a solid player in defensive end Ty Warren, but traded down one spot with the New England Patriots. At that spot the Bears might have chosen safety Troy Polamalu, center Jeff Faine, guard Eric Steinbeck or cornerback Nnamdi Asomugha, but they didn't. Haynes only started four games for the Bears, registered 5.5 sacks, and was cut after three seasons. 1. Cedric Benson-RB-Texas-Round 1 2005: With the fourth overall pick in the 2005 draft, the Bears selected Cedric Benson. My personal favorite pre-draft line about Benson was that he was built like (former Saint and Dolphin) Ricky Williams, but wasn't as good and had more potential for problems. And the pundits were right. Benson was in full-fledged bawling mode when he went to the podium as the fourth-overall pick, and would later reveal that they weren't tears of happiness. No, Benson was crying because his agent had advised the Bears not to draft him because the Bears weren't prepared to meet Benson's contract demands. Thus Benson knew he would be a holdout from the moment he was drafted. And hold out he did, not arriving with the Bears until 36 days after the other players reported, after the entire preseason was over. And the players did not take kindly to the new arrival. Benson looked solid in spot duty in 2005 before being injured and missing significant playing time, then again looked good in a supporting role to starter Thomas Jones in the 2006 Super Bowl season. Prior to 2007 Angelo traded Thomas Jones to pave the way full time for Benson, and Benson again missed much of the season with an injury. In his sole season as the starter Benson rushed for 647 yards and four touchdowns. Following an arrest prior to the 2008 season, the Bears cut ties with their highest draft pick since they had selected Dan Hampton in 1979. Players available in the draft when Benson was selected included DeMarcus Ware, Carlos Rogers, Antrel Rolle, Jammal Brown, Aaron Rodgers and Roddy White.